Buddhism has been inherited all the way from India through China, Korea, Thailand etc. and reached Japan hundreds of years ago. As we travel through Japan, we could see the influence of the Buddhism and its culture throughout the country. Japan has a lot of Buddhists temples and followers. Such temples are the important tourists’ spots and attract so many visitors, both natives and foreigners, every year. We could see many types of Buddha statues as we travel across the country which varies in their size, colour and shapes. Buddha statues with various faces could be seen in various poses. Daibutsu is the Japanese word meaning “Great Buddha” and “Daibutsuden” means “Great Buddha hall”. Each of the Buddha statues that we see here are different with various types of Buddha given different names according to the appearance and some other peculiarities. Nara daibutsu is one of the most famous and ancient statues situated in the Todaiji temple of Nara prefecture. The Great Buddha statue of this temple is 49.1 feet tall and it is the statue of the “Vairocana”, one among the many types of Buddha. Eventhough this statue has gone through much destruction from its beginning, it is always reformed and repaired. The Daibustsuden of Nara is regarded as the largest wooden building in the world. This temple is one among the UNESCO world heritage sites and the great Buddha is regarded as the National treasure and a historic monument of ancient Nara. The main attraction of this temple and surroundings is the deer park. A lot of visitors are coming to this place everyday. The cute cheerful deers and the vast temple area with various other attractions could be seen around the Todaiji temple. This is the tallest Buddha statue of Japan. It was created in 1995 only with a height of 130 feet, it was numbered as the tallest statue of the world by the Guinness Book of World records till 2002. This bronze statue is situated in the Ushiku region of Ibaraki prefecture and is surrounded by a beautiful lawn, flower garden, Animal Park and a pond with Koi fishes. The statue is four storeyed inside which acts like a musuem. There are about 3300 golden Buddha statues in the third floor of this statue named as ‘The World of lotus Sanctuary’. There is an elevator which takes visitors to the chest part of the Daibustsu and gives and opportunity to enjoy the beauty of Ushiku region including the beautiful surroundings of the statue from there. The Daibutsu of Kamakura of Kanagawa prefecture is that of the “Amida Nyorai” with a height of 43.8 feet. Built in 1252, it is associated with the Koutokuin temple. The Daibutsu was inside a temple hall at the beginning which was further destroyed by storm, earthquakes, tides etc. many times. At last the statue was exposed and kept as such. Visitors can enter inside the hollow body of the Great statue. This statue of seated Buddha in the meditation pose is the second largest statue of Japan which is regarded as a historical monument. Built in 1221, the Takaoka Daibutsu has gone through many renovations. Eventhough the golden coloured statue was made of wood in the beginning, it has been destructed by fire and natural calamities and today’s copper statue of height 52 feet was made in 1933. This is the world’s largest lying Buddha statue of the world called the “Nehanzou”. 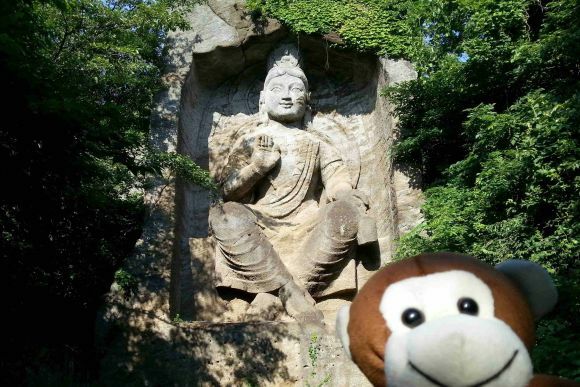 Built in 1995, it is situated in Nanzoin temple which was transferred from the Mt. Koya of Wakayama prefecture. It has a length of 41meters and height of 11 meters and is regarded as the largest Buddha statue of the world according to some studies. Built in some ancient times, with a height of 31 meters, “Bhaisajyaguru” is the Buddha situated here. There are about 1500 other statues surrounding this great Buddha statue named as “Yakushirurikonyorai”. The Great Buddha statue has been carved out of the Mt. Nokogiri. Like other ancient Buddha statues of Japan, this statue has also gone through many reformations from the beginning after destructions caused by natural calamities. The mountain area with the statue heading up is a beautiful location of Chiba prefecture. This Great Buddha statue of ‘Vairocana Buddha’ is situated in the Buddhist temple Seiryuu-ji or the Kouyasan Betsuin of Aomori prefecture and is built by Ryuukou Oda in 1984. This Buddha statue is 70 feet tall in a meditation pose on a lotus seating. The Obon festival of August is the most important among the festivals of this temple which attracts a lot of people to this area. It was one of the Great Buddha statues of early Japan which was built in 1631. Situated in the Ueno park region, this is a statue with the Great Buddha’s head only. In the beginning, it was a big statue of Great Buddha made of copper. It has gone through destructions due to earthquakes, war etc. and the other parts of the statue was melted for making weapons during the world war and the head portion only is remaining now. The Tokyo’s Great Buddha built in 1977 has a height of 42.7 feet. This is the largest Buddha statue of Japan after the ones at Nara and Kamakura. It has similarity to the Kamakura daibutsu. Having a height of 44.7 feet, this Great Buddha named “Shaka Nyorai“of Gifu prefecture is situated in the Shouhou-ji temple of Gifu prefecture. It was built in 1828 using special Japanese woods like Ginko, Bamboo and further shaped using clay and decorated with gold leaf. Based on the method of construction, it is the largest statue of this kind in Japan. The Daibutsuden holds about 500 statues of various Buddhist disciples and the entrance has a statue of Yakushi Nyorai (Buddha of Medicine). The Great Hall and the Buddha statue are really unique with its architectural appearance.